Takashi Miike’s breakthrough movie for Western audiences, this is a haunting masterclass in escalating dread that has far more to offer than the (comparatively brief) gruelling moments of torture for which it became (in)famous. It opens as a poignant tale of loss and grief as middle-aged father Ryo Ishibashi spends seven years mourning his late wife before a close friend recommends an ethically dubious means of finding a new female companion. 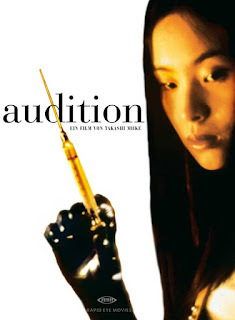 The faux “auditions” they stage results in a union with timid, soft-spoken 24 year old Eiki Shiina, a sombre former ballet-dancer who harbours a lot of troubling secrets. "Dark Water" (2002, Hideo Nakata) for sheer cool chillingness. I love Japanese cinema. I was blown away with Battle Royale although the sequel was terrible. My fave film is probably Old Boy but I'm big time into my Japanese animé - Hayao Miyazaki is my hero - Spirited Away & Princess Mononoke my fave films. I absolutely the Death Note films.